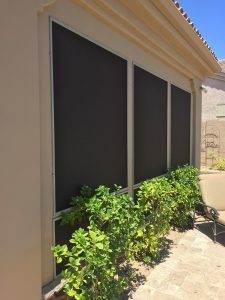 Since 2008 we have been building bug screens, sun screens, and sliding door screens for our customers all over the valley. There are many benefits to sun screens, the most obvious is reducing the heat coming through your windows, which reduces your utility bill…by as much as 20% (APS,SRP). We use the best product on the market, Textilene with 1” frames. Why is this important? Many competitors use a lesser product with ¾” frames that can easily bend. Our 1” frame is more durable and Textilene can block 90% of harmful UV rays from the sun. And, did you know they also protect your furniture and artwork from harmful UV rays while offering more privacy? But the biggest benefit of all, most realtors will agree they increase the value of your home. Our professionals will ensure you have a great product AND experience. Most screens built and installed same day on site!